I wish my tip was how to properly hold and use chopsticks in the traditional way, but I’m white as white can be. Just ask my dance moves. 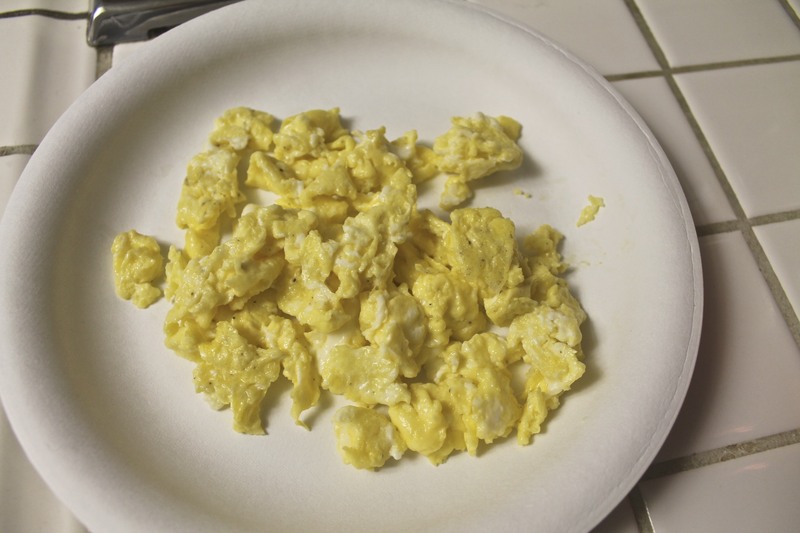 Instead, I’m going to tell you a secret about scrambling eggs. I often feel like people don’t know there’s an art to it. 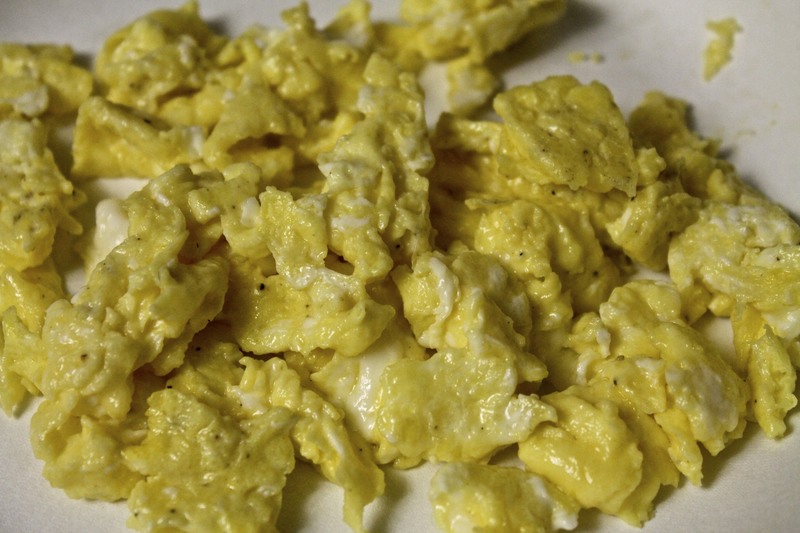 Scrambled eggs can either be delicious or highly despicable. If you use chopsticks, they’re the former. Chopstick experts: how's my form look? Some people add lots of milk or cream to their eggs thinking it will make them creamier. Not so, my friends. 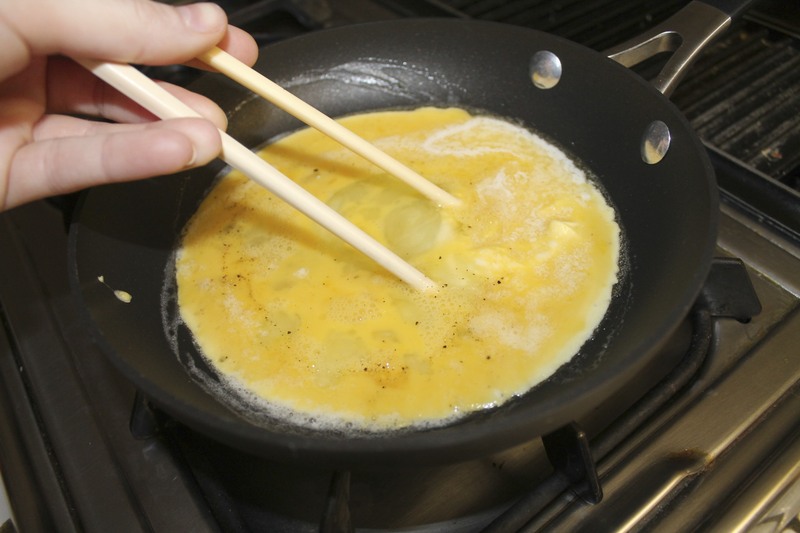 The secret to creamy eggs is low heat (fry high, scramble low) and chopsticks! See the curds starting to form? Well, look closer then. 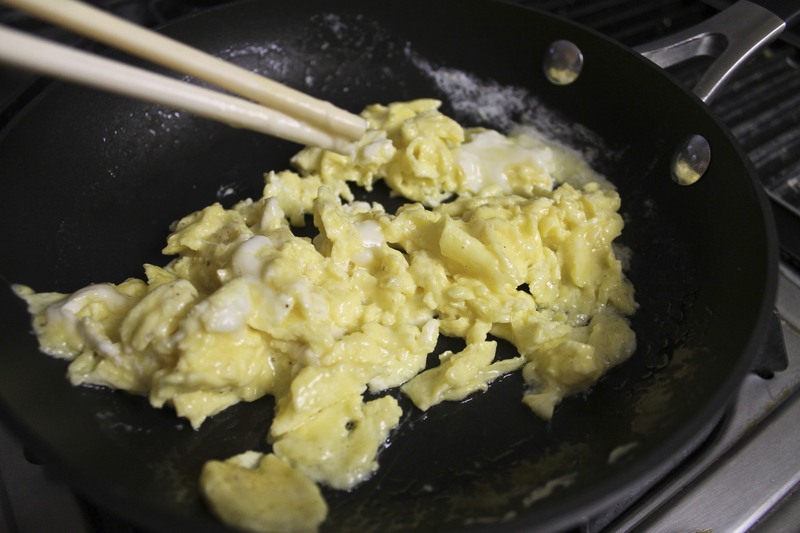 Stirring eggs with some chopsticks will help break those eggs up into small and creamy curds. Make sure you constantly stir with the chopsticks while you shake the pan to help break up those curds nice and small. Stir, Baby, Stir! Chopstick Inferno. See? Beautiful. Another tip is to take those eggs off when they still look moist. The carry-over heat will continue to cook them. So to keep those eggs from being a rubbery hot mess, take them off the heat early. And another benefit of using chopsticks? They play nice with teflon. Of course, silicone-tipped chopsticks would be even better. No one steal that. I’m copyrighting it. In fact, I’m sending it over to be patented right…..now. 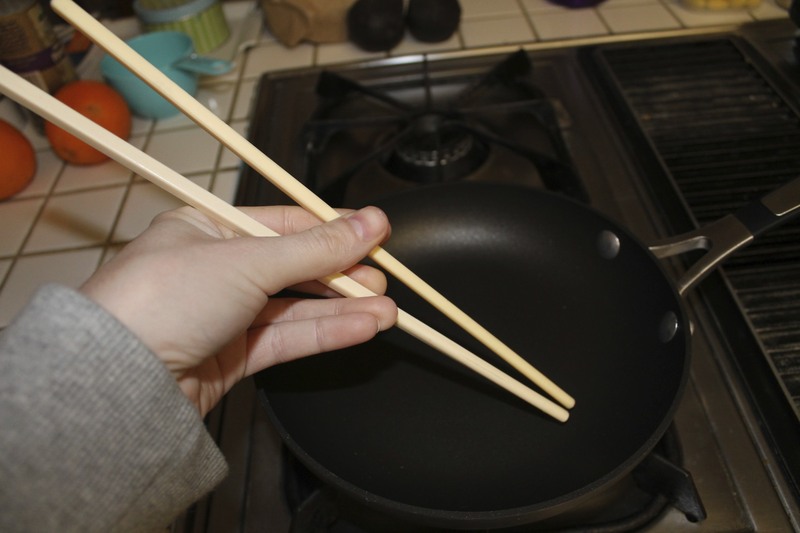 How do you use chopsticks in cooking? Ever used them to scramble your eggs? p.s. sorry for yesterday’s dull post. I’ve got a throat infection and had yet to receive any antibiotics. Two pills have made me feel my chipper self again! My sarcasm and bad-joking making may now continue. As a frequent user of chopsticks, I thought this post was nice to show another function of chopsticks besides carrying the food into one’s mouth. And not only are chopsticks more less likely to ruin the pan, they seem a more gentle utensil when trying to grab food from a plate…instead of stabbing the food with a fork or knife. I agree…chopsticks are wonderful and functional in all sorts of ways. And I feel as though you’re less likely to overeat with chopsticks. 😀 Thanks for reading!